Start the new year with an apple french toast bread pudding. 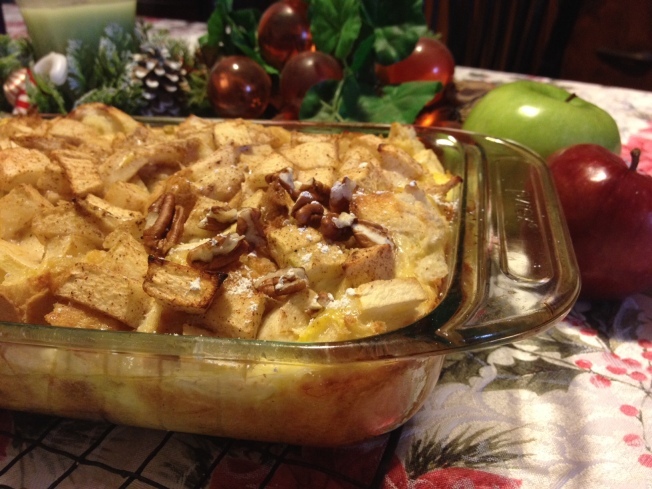 Wayne's Weekend: Celebrate New Year's Day with a brunch featuring this apple french toast bread pudding. I’m probably one of the few people who doesn’t do a lot of celebrating on New Year’s Eve. But, I do enjoy spending time with family and friends on New Year’s Day. Putting together a hearty breakfast or brunch is a great way to welcome in the new year in a much more relaxed fashion. You can also prepare many elements in advance to minimize your time in the kitchen on New Year’s day. This apple French toast bread pudding is always a crowd pleaser and a nice centerpiece for your brunch. All of the prep work is done the day before and all you have to do is put it in oven an hour or so before you’re ready to serve. In addition to the bread pudding, I’ve also included my tomato tart recipe plus suggestions for other items to include in your buffet. Butter a 2-quart glass baking dish. Cover the bottom with the bread pieces. Mix apples with lemon juice, cinnamon and nutmeg. Pour mixture over bread. Place eggs in a medium bowl and whisk in milk, sugar, and vanilla. Pour mixture over apples and bread. Press down all the bread to make sure they have been moistened. Cover with aluminum foil and refrigerate overnight. In the morning, place baking dish on the middle rack of a cold oven. Set temperature to 350 degrees and bake for 35 minutes. Carefully remove the aluminum foil and bake for an additional 40-45 minutes until puffed up and golden brown. Insert a wooden skewer, toothpick or knife into the center. If it comes out clean, the bread pudding is ready. Meanwhile, heat syrup in a microwave until just warm. Scoop bread pudding onto serving plates. Allow guests to sprinkle pecans on their serving and pour warm syrup on top. Combine flour, butter, cream cheese and bacon in a food processor using the dough blade, if available, or regular steel blade if not. Process until mixture comes together and forms a ball. Remove dough and wrap in plastic. Refrigerate for an hour. If you don't have a food processor, simply cut the butter and cream cheese into the flour. Add in bacon and work the mixture with your hands until a smooth dough forms. Wrap in plastic and refrigerate. After an hour, split dough in half. Roll out each half on a lightly floured surface forming a circle about 10" in diameter. Lightly dust the bottom of the tart pan with flour and place the dough into it. Press the dough into the bottom and sides of the pan. Using a fork, poke the bottom of the crust about 15-20 times. Repeat with the second second crust. Place both crusts in the freezer for 20 minutes. Preheat oven to 400 degrees F. Place chilled crusts on a baking sheet and bake for 12 minutes. Remove from oven and allow crusts to cool completely. If you are using grape or cherry tomatoes, slice them in half. If you are using larger tomatoes, then slice them into 1/8" thick slices. Place the tomatoes on a paper towel (cut side down with the smaller tomatoes) for 15 minutes. Then, put tomatoes in a bowl and toss them with salt, pepper and oregano. Once crusts have cooled, cover each with half of the fontana cheese and half of the parmesan cheese. Arrange half of the tomatoes on top of each crust, covering all of the cheese. Cut and add a few more slices of tomatoes if necessary. Bake tarts at 400 degrees F for 20 minutes or until the crusts are golden brown and tomatoes have wilted. Remove from oven and top with basil chiffonade. Serve tarts at room temperature. To round out your buffet, include the basics like fresh fruit, a combination of juices, coffee and milk. You can also provide granola or other dry cereals. If you’d like to include traditional breakfast fare, like eggs and breakfast meats, consider using a crock pot (or a few crock pots) for pre scrambled eggs, cooked sausage or bacon, and a simple potato sauté of diced potatoes, red peppers, yellow peppers, onions, oregano, thyme and scallions. Lastly if your guests are still in celebration mode, a bottle of champagne might be a nice finishing touch.